Conservatories have always been an excellent way for consumers to blur the margin between home and garden, but we’ve taken the idea to a new level with our Veranda conservatory. 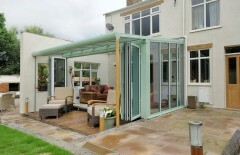 The glazing bars in the roof oversail and carry the glass with it, to form a ‘cocoon’ where you can sit in the garden and be protected from the worst of the elements. 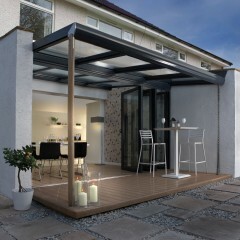 Moreover, on a warm day - by using large in line sliding patio doors or bi-folding doors you can then open everything up for a much larger space to use as you wish, perfect for socializing or as a large play area. 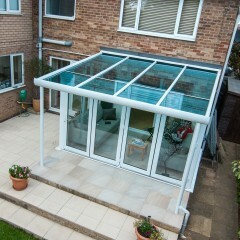 The Veranda conservatory comes complete with built-in tracks for fabric panelled shading devices called Shades. 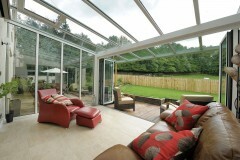 Inside the conservatory they feature a soft fabric to theme through with a choice of home furnishings, whilst outside under the oversailing eaves/glazing they are manufactured from a hard wearing and weatherproof fabric, similar to that used in awnings. 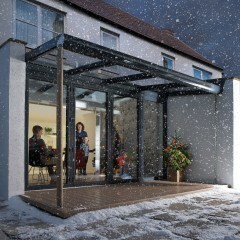 Click on any of the thumbnails below to get further inspiration for your Veranda. Think carefully about the external design and the internal features and ask one of our local Register Installers for additional expert advice.